You are here: Home > News > UAHS calls for a heritage led future for Bank of Ireland, Belfast. The former Bank of Ireland on Royal Avenue was designed by J.V. Downes of McDonnell & Dixon of Dublin between 1928 and 30. Distinctly Art Deco in style, constructed of a steel frame clad in Portland stone. One of the most notable examples of a limited number of Art Deco buildings in Belfast, the Bank of Ireland, Royal Avenue has featured on the UAHS Built Heritage at Risk database for over 10 years. We continue to receive a significant amount of enquiries regarding its protection and future. Much of its historic fabric and detailing survive, including detailed stone features and metal window panels and doors. It is also acknowledged to be an early example of the use of a steel frame structure. 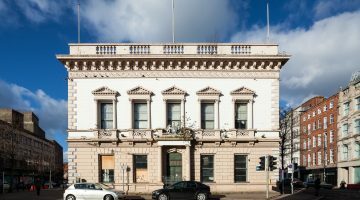 We hope that the recent acquisition will signal an opportunity for the positive, heritage led regeneration of the Bank of Ireland, one that respects its listed historical and architectural attributes in full. Click here to read the Belfast Telegraph article in full.